Queen Candypop Buds are Candypop Buds found in Pikmin 2, quite different from the others in the game. They allow the player to gain up to 8 Pikmin if a single one of any type is thrown in. The flower's spots alternate between red, blue and yellow, presenting the player with an opportunity, with correct timing, to choose between receiving Blue, Red or Yellow Pikmin. Only as many more Pikmin as can exist on the field are produced; if there are already 100, the Pikmin thrown in just changes type. The plant withers after it has been used once. 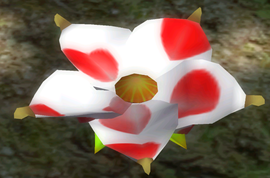 These flowers are found only in certain sublevels of difficult caves, usually immediately before or after a particularly challenging boss battle. These areas are usually void of enemies, so they are sometimes referred to as "rest sublevels"; they contain other such useful things as eggs and other types of Candypop Bud. Queen Candypop Buds are far more common in Pikmin 2's Challenge Mode than in the main game, mostly appearing where the player starts off with very few Pikmin, such as Breeding Ground, Hot House and Hidden Garden. Subterranean Complex: Two on sublevel 8. Snagret Hole: One on sublevel 6, and two on sublevel 7. Citadel of Spiders: One on sublevel 3. Glutton's Kitchen: One on sublevel 5. Shower Room: Two on sublevel 4. Cavern of Chaos: One on sublevel 4, and one on sublevel 5. Hole of Heroes: One on sublevel 5, one on sublevel 8 (Bulbmin available), and one on sublevel 12. Hot House: Three on sublevel 1, and one on sublevel 2. Concrete Maze: Two on sublevel 3. Hidden Garden: Six on sublevel 1. Breeding Ground: Five on sublevel 1, and seven on sublevel 2. Emperor's Realm: Three on sublevel 3. Artwork for the Queen Candypop bud. The Queen Candypop Bud when it's yellow. The Queen Candypop Bud when it's blue. Clay artwork of the Queen Candypop bud. This page was last edited on March 30, 2019, at 05:05.